As has been well-publicized in recent months, Facebook, at 2.2 billion users, has become a weapon for political propaganda. There are various elements to this. The first consideration, as noted, is reach - political activist groups know that they can get their messaging in front of the largest concentration of people possible via Facebook, and that they can target specific users with messaging designed to appeal to their leanings. But more than that, Facebook's News Feed algorithm actually lends itself to divisive political debate. Because the algorithm favors content that sparks on-platform engagement - back and forth discussion within comment streams on posts - politically motivated groups have found that you can use that poke at people's specific fears, and potentially influence their voting decisions by amplifying concerns. That's what Russian-backed groups used to fuel divisive debate among US voters ahead of the 2016 US Presidential Election, and while its impossible to know exactly what impact such actions had on voter behavior, it is clear that Facebook can be weaponized in this way. And logically, Facebook's very keen to stamp it out. This week, Facebook has announced some new measures designed to fuel healthy political debate, free of outside interference, in the lead up to the US midterms in November. The first measure Facebook's rolling out is a new program to help ensure that those involved in electoral campaigns are not hacked and their accounts misused by outside groups. "As we have seen in past elections, candidates and elected officials, as well as their staff, can be targeted by hackers and foreign adversaries across platforms, including Facebook. However, due to the short-term nature of campaigns, we don't always know who these campaign-affiliated users are, making it harder to help protect them. That is why, today, as part of our broader efforts to better secure Facebook, we're launching a pilot program to expand our existing protections for users associated with US political campaigns ahead of the 2018 midterm elections." Under the new program, candidates for federal or statewide office, as well as staff members and representatives from political party committees, will be able to add additional security protections to their Pages and accounts. Page admins are able to apply for the program at politics.fb.com/campaignsecurity. Once enrolled, they'll be able to add others from their campaign or committee, with Facebook then offering guidance on how they can adopt the platform's strongest account security protections, including two-factor authentication. Once registered, Facebook will also be able to add those users to their watchlists to monitor for potential hacking threats. "We're working to bolster our defenses so that participants in this pilot will hopefully not need these expanded protections. In the event that they do, however, this program will help us quickly detect, and participants quickly report, any targeting that does happen. If we discover an attack against one campaign official, we can review and protect other accounts that are enrolled in our program and affiliated with that same campaign." Really, all users should be looking to secure their accounts with Facebook's more advanced security measures, but according to Wired, most users still don't have two-factor authentication enabled on their accounts. Facebook doesn't report stats on 2FA adoption, but they have been adding in more ways for more users to turn-on the check, which significantly boosts the security of your account. In addition to this, Facebook's also opening up a new application processfor news publishers in its ad archive. 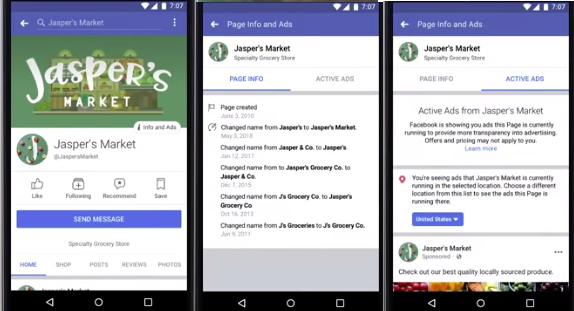 "Facebook's Ad Archive, launched in June, lets people search for ads related to politics or issues of national importance, such as education or immigration. When news outlets run ads on Facebook to promote stories involving elected officials, candidates for public office, or important national issues, we include them in the archive. We believe transparency across all ads is important, but we also know that news is different from other types of political and issue ads, which is why the archive displays them in different sections." Because news outlets report on political content, but are not advocates as such, Facebook will look to categorize them accordingly, and ensure that news providers are not subject to the same stringent regulations on ad transparency as politically-affiliated groups. For this, news publishers will need to apply to have their Pages categorized in the 'News' section of the ad archive. To be included, publishers will need to demonstrate that they abide by the guidelines Facebook has developed with news organizations, academics and industry groups. "For example, Pages must focus primarily on current events and information, cite sources, and include bylines and dates. Pages that primarily publish ads or promotional content are not eligible. Pages cannot have a record of publishing articles that have been rated false by our third-party fact-checking partners." That should add another interesting wrinkle to the debate over Facebook's role in media distribution, and how it selects and defines certain content. Facebook says its rolling out the index submission process gradually, starting first with a subset of English-language Pages. More information on the process, and the interesting requirements for qualification, is available here. And lastly, in politically-related Facebook news, Instagram is launching a new initiative to help raise awareness of the upcoming midterms, and of the importance of registering to vote. 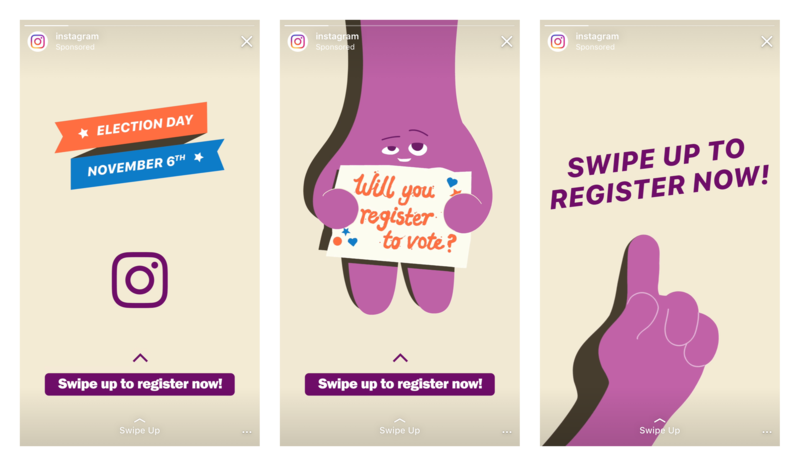 "Instagram's partnering with TurboVote to make voter registration as simple as possible. Using ads in Feed and Stories, our platform will provide a way for US voters to get up-to-date information on how to register, how to update their registration, how to look up their state’s voting rules and more. From the first swipe up in Stories, getting the information you need to register to vote takes only a few minutes." "We’ve seen in past elections that people love to share that they’ve voted through selfies, especially with an “I voted” sticker. We’ll make this experience even more fun with a custom “I voted” sticker in the camera. The sticker will link to Get to the Polls to help voters find their polling location on Election Day." And while this may seem like a minor move, it can actually have a big effect. Back in 2010, researchers estimated that around 340,000 extra voters turned out to take part in the US Congressional elections because of a single election-day Facebook message. The researchers used a variation of 'I voted' type messages to test potential response. "About 611,000 users (1%) received an 'informational message' at the top of their news feeds, which encouraged them to vote, provided a link to information on local polling places and included a clickable 'I voted' button and a counter of Facebook users who had clicked it. About 60 million users (98%) received a 'social message', which included the same elements but also showed the profile pictures of up to six randomly selected Facebook friends who had clicked the 'I voted' button. The remaining 1% of users were assigned to a control group that received no message." 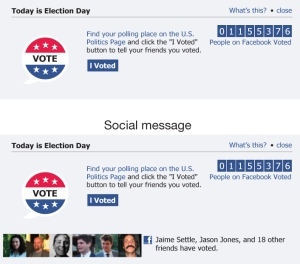 The results of the test showed that users who received the informational message (the top message in the above image) voted at the same rate as those who saw no message at all, while those who saw the social message - with images of their friends included (lower example in above image) were 2% more likely to click the 'I voted' button and 0.4% more likely to head to the polls than the either group. The study proves both the capacity for Facebook to influence election outcomes and the potential of this type of participatory messaging. But really, security is the key concern. In addition to these measures, Facebook says it's taking a range of steps ahead of the US midterms to better secure Facebook more broadly, and better detect and remove potential threats. It's a never-ending process - hackers continue to get more advanced, and adapt to any such changes - but hopefully we'll be able to see an electoral process without interference, enabling us to get a more objective view of the actual state of modern society.